A North Yorkshire nursery has received national recognition in the Nursery World awards, for the exceptional quality of its food and the way it is integrated into every day life for its children. Incy Wincy’s Day Nursery in Bedale is Ofsted rated Outstanding and has a number of other prestigious awards and accolades including Royal Horticultural Society Level Four, Investors in People accreditation and the Children’s Food Trust’s ‘Outstanding Food Award’. Incy Wincy’s was judged against other high-quality nurseries from around the UK, and Director Annalisa James believes the success is attributed to the nursery’s ‘holistic’ approach to food. She said: “Food is an area we have focused on since we took over the nursery in 2013. It’s more than just ‘food on plates’, the children learn where their food comes from, grow it themselves, appreciate how it is used to create different dishes and experience different culinary styles to broaden their palettes. Chef Rob Hartley has worked on the nursery’s menu with the wider team to include tempting dishes such as spiced paneer, chickpea and sweet potato curry, and Moroccan lamb kebabs with tzatziki and flat breads; an initiative has been rolled out to allow parents to purchase ‘take home meals’ – adult-sized portions for them to enjoy when they get home from collecting their children. The nursery’s wider focus on food means that the children are immersed in a hands-on experience with what they eat; running their ‘Star Baker’ business, regular trips to the pick-your-own farm, market and local bakery. 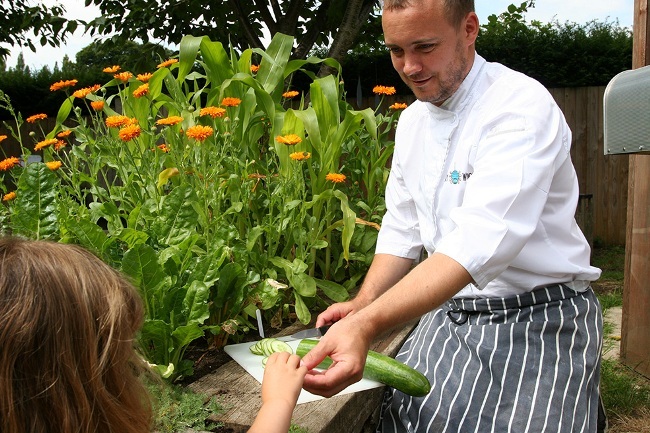 This year the staff and children have developed the kitchen garden and children can cook lunch in the on-site pizza oven using freshly picked ingredients. Nursery Manager Sarah Moon-Gatford said: “It’s important to us that children have a positive relationship with food, we enjoy the social side of it; cooking, growing and eating together. Our team have worked to create a relaxed learning experience with wholesome food at the heart of it. The nursery has worked hard to ensure it caters for a variety of dietary needs including allergies and religious requirements. The focus is on fresh and wholesome food that will help children to grow up happy, healthy and full of life. Incy Wincy’s Day Nursery has expanded over the last two years with the acquisition of the town’s former children’s centre which has enabled the nursery to open the Grasshopper Pre-School, offering term-time only daycare in addition to its more traditional 51-week provision.